Þap ve Tekin amaçlarýný ; " Fiziksel engelin, herþeyin sonu demek olmadýðýný spor aracýlýðýyla tüm insanlara göstermek ve Türk bayraðýný dünyanýn pek çok ülkesinde dalgalandýrmak " þeklinde açýklýyorlar. Dünyadaki saðlam ve fiziksel engelli insanlara mesajlar vererek, Spor ve Barýþ Elçiliði görevlerini çok ciddi biçimde uyguluyor ve Türkiye'nin tanýtýmýnda önemli rol aldýklarýna inanýyorlar. They define their goal as,"To show that a physical handicap is not the end of everything and to show the Turkish flag in as many parts of the world as possible".They give messages to able-bodied and disabled people around the world. Sap & Tekin take their role as Sport & Peace Ambassadors very seriously,believing that they have an important role to play in promoting Turkiye overseas. Þap ve Tekin, Türkiye'yi dünyadaki uluslararasý maratonlarda temsil ettiler ve gittikleri heryerde olaðanüstü ilgi görerek 6 kýta (Avrupa-Avustralya-Asya-Afrika-Kuzey Amerika-Güney Amerika) ve 19 ülkede (Türkiye -Avusturya -Avustralya -ABD -Ýsviçre -Hollanda -Endonezya -Vietnam -Güney Afrika -Japonya-Arjantin -Kamboçya -Porto Riko -Bulgaristan -Moðolistan -Hong Kong -Kanada -Rusya-Tayland ) 91 yarýþa katýldýlar. 1 Ocak 2003'e kadar koþtuklarý toplam mesafe 1604 km oldu. 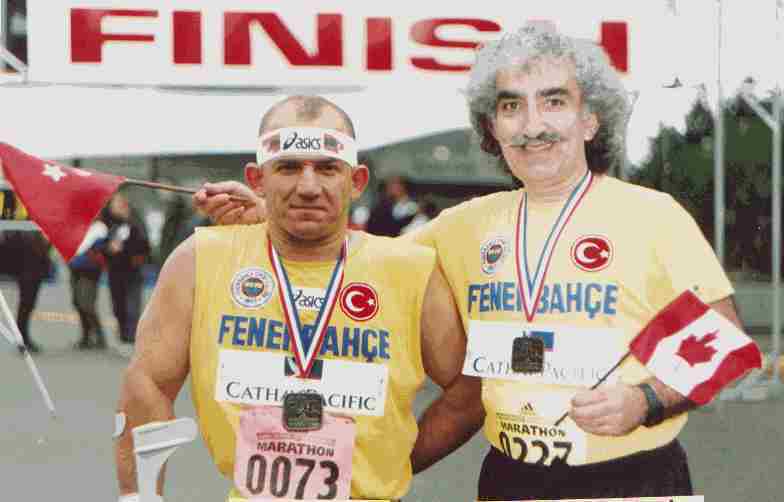 Sap & Tekin have represented Turkiye in international marathons all over the world and competed in 91 races in 19 countries on 6 continents (Europe,Australia,America "north&south",Asia,Africa) attracting enormous interest everywhere. The total distance they ran , until 1 January 2003 , is 1604 km. Þap ve Tekin kimdir / Who are Sap & Tekin ? He was born in Istanbul in 1945.He graduated from Yildiz Technical University in Istanbul.He worked in several companies as an Electrical Engineer and a manager.He got engaged in sports by playing football in Beylerbeyi-Istanbul in 1960.He got interested in Athletics in 1962 and wore the colours of Fenerbahçe Sports Club until 1970.He carried the Olympic Torches of 1964 Tokyo and 1972 Munich Olympic Games.He worked as a Trainer and a Sports Manager.In 1976,he was elected to be the first secretary general of NETAS Sports Club,of which he is a founder member.He worked in the founding committee of the Istanbul Eurasia Marathon in 1979.Between 1985-1987,he worked as the Managing Director of the SISECAM Athletics Club.Under his management , SISECAM Cross Country Team won the bronze medal amongst the European Countries in 1987 in Clusone/Italy.In 1986,he prepared the project of the 1st International Golden Horn Half Marathon,in which 7500 athletes took part,and applied it together with the Municipality of Eyüp-Istanbul.He has worked for four years as the race director of the Golden Horn Half Marathon.In 1987,he assisted for Turkiye's AIMS membership.He attended as the Turkish delegate to the IAAF congresses held in Rome in 1986 and in Bratislava in 1987 and to the AIMS world congress in Melbourne in 1988.He organised the AIMS Board Meeting in Istanbul in 1989.He has been the first Turk who has measured a marathon course abroad,by measuring the Vietnam Marathon course in Hanoi in 1995.He appointed as AIMS Press & Public Relations Manager for Turkiye by AIMS Board in August 1998.He has been to 52 countries on 6 continents.He ran marathon in 19 countries.He is a bachelor and speaks English and a little bit Italian besides his native language of Turkish.He is a Congress Member and a Member of the Supreme Council of the Fenerbahce Sports Club.He is the man who has taught,mentored and coached the disabled marathoner,Yavuz Sap,since 1985.
visitors since, 7/7/2000, 'den beri ziyaretçi sayýsý.